Last weekend, I did ALL the laundry. I don’t mean, I got the major stuff (jeans and underwear) done. And I don’t mean everything but the towels. Or everything except for the delicate load that I’ve needed to wash for six weeks. I mean jeans, colors, whites, sweaters, towels, sheets – the WHOLE stinkin’ mess is clean. 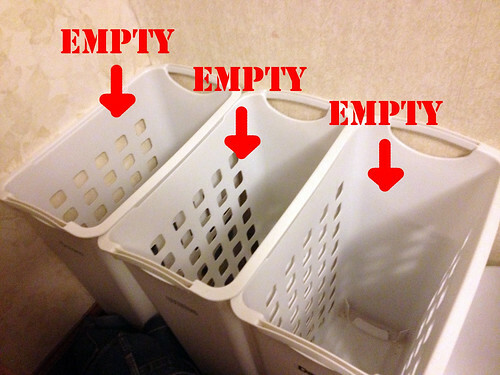 For about five minutes there was nothing in the baskets, nothing on the floor in the bathroom, nothing hanging on a door handle. It was done. It was all very exciting. Or at least it was for this working mom. And then? For three days now, I’ve done a load a day to keep up. I know. It’s just too much. I know by writing this, I’ll jinx it. But hey. I’m going to celebrate while I can. Hey. those baskets have stickers on them. Are you sure you didn’t take this photo at Walmart? Just kidding! What I really want to know is did all the socks match up? Any loners? They did not all match up. If they did, that would be more than a victory – that would be like winning the World Series, wouldn’t it?! …and if the socks all did actually match up — you need to get to town ASAP and buy a lottery ticket…because you’ve got luck in your favor!! !